The water tower at Welisara, which sits at a high elevation, is a concrete structure of 1,500m3 (350,000 gallons) capacity constructed by Tudawe Brothers. Meanwhile, the ground water reservoir at Ja-Ela, also constructed by us in concrete, has a capacity of 450 m3 (100,000 gallons). Transmission and distribution pipe work for both the Ja-Ela and Welisara areas were also undertaken as part of the scope of this project. Tudawe Brothers undertook the construction of a water tower and sump with a capacity of 40,000 gallons and 50,000 gallons respectively, for the benefit of the engineering faculty of the Ruhunu University. The pumping and distribution system were also carried out by us. Tudawe Brothers was entrusted by the Ministry of Industrial Development with the water supply contract for this major industrial park project, extending across 168 hectares. Our scope included 1,300 metres of DI transmission line from the treatment plant to the service reservoir, construction of the RCC reservoir of 6.61 million litre capacity at the crest of a rock, and 6,300 metres of DI distribution lines from the reservoir to the identified industrial lots. A considerable volume of rock excavation and earth work were involved in this project, which included manholes, valve chambers, thrust blocks, culvert crossings, side ditches for drainage, heat insulation on the roof of the reservoir, internal roads, fencing, slope protection, pillar type fire hydrants and surface boxes. Development of Sapugaskanda Industrial Estate. This project was awarded the IFAWPCA Silver Medal for Civil Engineering in 2002. It involved additions and improvements to the existing infrastructure facilities at the industrial estate. The M and E installations and systems at the river 'intake' and raw water treatment plant were rehabilitated and the associated buildings and structures refurbished. The fire fighting network was improved by extending the DI pipelines, providing new hydrants and replacing the pumps. 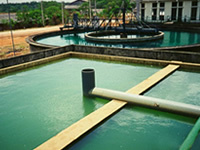 The oxidation panel was modified with three rotor aerators, and a flash mixer, a flocculator chlorifier, a treated effluent storage tank, a pumping station and drying beds were added to facilitate the primary and secondary treatment of industrial waste. Storm water drainage, GSW effluent lines and new roads were constructed to cater to the new demands of the industrial estate. 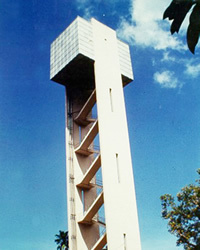 This rectangular tank resting on two RCC walls braced with stairs is the tallest water tower in the city of Colombo. Its capacity is 140,000 gallons and a pump house is situated at its base. The structure was erected with 320m3 of fair-face concrete (grade 30). Stainless steel pipes of an 8" dia are used. The existing underground sump with a capacity of 200,000 gallons was renovated by us.